Hike, climb, cycle, surf, canoe… there are countless ways to explore a country if you’ve got a taste for adventure . America’s National Park System is one of the best places to explore undisturbed nature at its best. After moving through the various national parks over the years, this was the time to visit the national park which has the highest footfall on the states. This time the visit was to Atlanta, GA and luckily this big city was just a 3 hrs drive from The Great Smoky Mountains National Park. This makes this a ideal weekend destination. On Day 1 we visited the main park road which is a very beautiful drive. We stopped at the visitor center at Cherokee and then moved ahead. 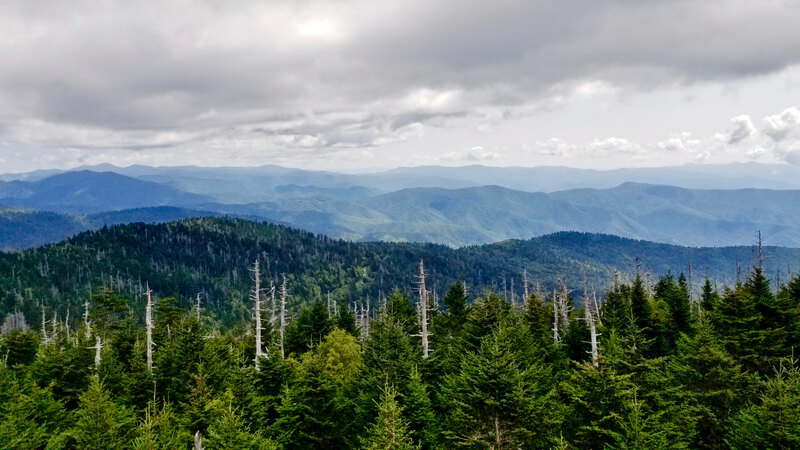 We stopped at various view points on the way and finally reached the highest point on the park, Clingman’s Dome. From the parking lot, the top is about 15 minutes walk on a level path and the views are brilliant from here. After coming back to the parking lot, we decided to head to the trail. The choice was Andrews Bald trail. The day was fantastic with cold wind and warm sun. The 1.8 miles one way trail is beautiful. It took us 45 minutes each way. After the trail we headed towards Gatlinburg and by the time we reached there, we were tired. We checked into the hotel and then went for a late lunch. Gatlinburg is a beautiful town with western charm around the main road. This tourist town has a nice feeling in it. Pretty much everyone here is tourist. On Day 2 we headed to Grotto Falls Trail. 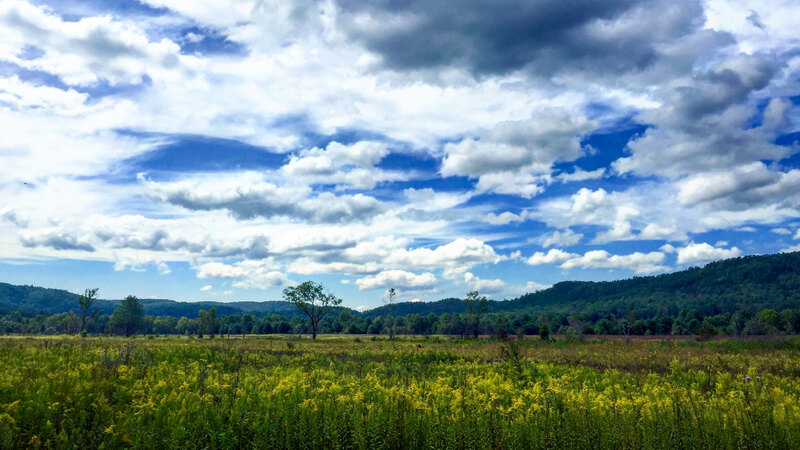 This 2.6 miles roundtrip trail is easy and beautiful. We liked it better than the other trail. The hike was easy and we returned after a couple of hours on the trail and the waterfall. Then we headed towards Cades Cove and spent the rest of the day there before heading out of the park and driving back to Atlanta. On the two days, the best scenes are undoubtedly from Cades Cove which is the best place in the park. 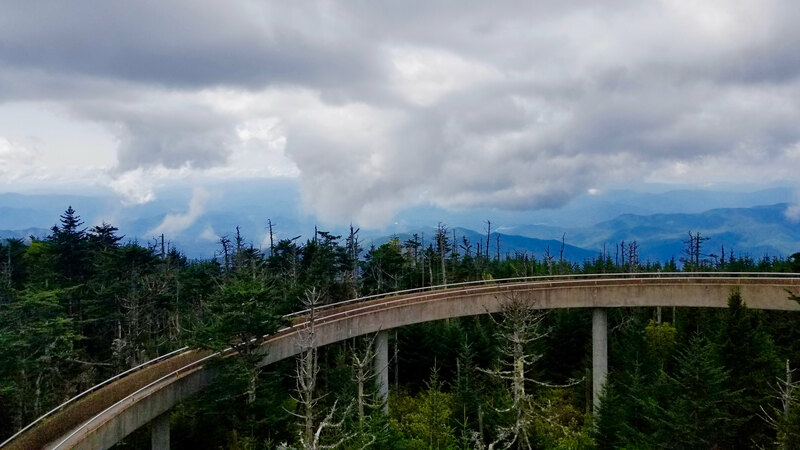 The views from Clingman’s Dome come a close second. Smoky Mountains is a great place to hike and camp and undoubtedly an awesome destination for witnessing Fall Colors. Hidden scene like these makes Great Smoky Mountain National Park magical.